The Encyclopedia of Immaturity has been such a hit that Klutz is following up with a second book! The Encyclopedia of Immaturity Volume 2 includes thought-provoking topics such as how to slide down a banister, what we talk about when we talk about wedgies, how to send a toiletgram, and more. It’s all new and all hopelessly goofy. The book has a good mix of magic tricks, jokes, pranks. There are some pages that you can cut out and use, like extreme makeovers which adds goofy teeth to the bottom of your drinking glass or my favorite-grass to cover up the dog poop so it looks like you picked it up! 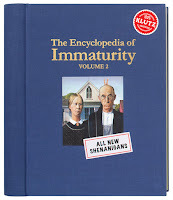 The Holiday's are coming and The Encyclopedia of Immaturity would make a great gift for the prankers in your life. And my loyal readers are in luck! Contest ends November 17 at midnight Central Time. Good luck! Eoin Colfer's Airman is getting a movie adaptation for Disney. Anne Peacock, who was a screenwriter for The Lion, The Witch and The Wardrobe is adapting the book, and Gil Kenan who directed City of Ember, is signed on as director. With the people signed on to this one, I have high hopes for it. Thanks to Cynopsis Kids for the news! The Pretty Little Liars Series by Sara Shephard is a series I can't keep on my shelves at the library-and now its on its way to the small screen. According to Hollywood Reporter (via MTV), ABC Family is very close to okaying a pilot for the show, with Lucy Hale set to star. My teens would be very excited about this show, so I hope ABC Family approves it! 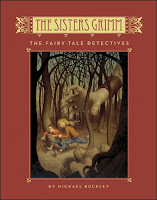 The Wicked series by Nancy Holder and Debbie Viguie was picked up by Dreamworks. The first script is being developed from the first two books in the series. Cirque du Freak hits theaters this weekend-go see it!! And just in time for the movie's release, there's a new iPhone and iPod Touch App called iFreak-it's a free download so make sure you check it out. You can take pictures and transform them into the characters from the movie. I've got it on my phone and I'll be sharing it with my teens at work-I'm sure they'll love it. So I've been sick with a cold all weekend which got me thinking about my childhood sick days. I didn't stay home sick very often as a child, but when I did it meant curling up on the couch with my favorite movies, chicken noodle soup, and a stack of library books. If I couldn't watch Anne, then I spent my afternoon with Little Women-the Elizabeth Taylor movie version. This one didn't top my list, since Jo and Laurie do not end up together which is endlessly frustrating and not great when you're already not feeling well. The other big deal in my house when we were sick (or had a day off school) meant we got to watch The Price is Right-if we weren't still asleep when it came on. My sister and I loved the Showcase Showdown and would sit through the rest of the show just for that. I always liked when they had a story or theme to them and when you're nine-years-old, winning a new car seems like the coolest thing in the world. We never understood why people would give up the cars. And since my library was always at the library, being sick meant I got to stay home with my library books. I would read books from home, books from the library, anything I had. I don't remember having a specific book I read when I was sick, I would just read. I still watch Anne and read when I'm not feeling well. I actually started Kate DiCamillo's The Magician's Elephant today and I think it'll make a great sick day read. When you're not feeling well, what books or movies are your comfort, feel better things? This is part of a tour for Traveling to Teens! About the Book: Cassandra Gray is a vampire-only she doesn't feast off blood, she thrives on human tears. Cass is always there when someone needs a shoulder to cry on and she'll be the one to listen and comfort. But Cassandra isn't happy with her manipulative life-she wants more and she wants to be human, especially since she's starting to fall in love with a human boy. Can she betray her family and the life she's always know? GreenBeanTeenQueen Says: While the premise for this vampire book is unique, it failed to work for me. It's supposed to be a paranormal book, but I never really got the paranormal aspect. It read much more like any contemporary fiction novel about a girl trying to break away from her family mold. It seemed like the paranormal stuff got thrown in there at times it needed to be mentioned-and on yeah, she's a vampire. Cassandra was a very unsympathetic narrator and I didn't care for her. I actually found her annoying and at times creepy. She was always comforting "friends" and she tries to reach out to goth girl Samantha. She doesn't even know Samantha, yet she's getting all gushy on her and encouraging her to let out her emotions because she knows she hurts. If someone I didn't know well started talking to me like that, I would be seriously weirded out!! There's also a romance plot to the book, but I didn't find it all that romantic or interesting, so I'm not sure I would even call this one a paranormal romance. There were many times it felt like I was reading a rejected script for a bad CW show-the dialog was corny and unrealistic, the characters were stereotypes (the goth girl who bottles up her emotions, the backstabbing cheerleader, the popular beautiful girl with secret issues at home, the dumb jock boyfriends). I thought that the author kept telling me what I should feel and why I was supposed to care instead of showing me, which was pretty weird since he even mentions that in the novel that good writing shows, not tells! Overall this one didn't work for me, although the plot picked up about halfway through. If readers enjoy unique takes on vampires, they might find something to enjoy in this one. You can follow the rest of the tour on the Traveling to Teens site and see what other reviewers thought! If you've been following my YA movies news, you know that The Vampire's Assistant is headed to theaters October 23. I have a very awesome giveaway for all you Cirque fans! About the Movie: In theaters October 23rd Cirque Du Freak: The Vampire’s Assistant, based on the popular series of books by Darren Shan, is a fantasy-adventure about a teenager who unknowingly breaks a 200-year-old truce between two warring factions of vampires. Pulled into a fantastic life of misunderstood sideshow freaks and grotesque creatures of the night, one teen will vanish from the safety of a boring existence and fulfill his destiny in a place drawn from nightmares. CIRQUE DU FREAK has been rated PG-13 (Parents Strongly Cautioned - Some Material May Be Inappropriate for Children Under 13) for sequences of intense supernatural violence and action, disturbing images, thematic elements and some language. -First, vote in the widget for your favorite t-shirt slogan. -Then, leave a comment letting me know which one you voted for! Please include a way to contact you if you win. -Contest open to US addresses only, ages 13+. Contest ends on October 15, midnight central time.